Christopher Brendel is an author and game designer dedicated to producing strong story-based titles. 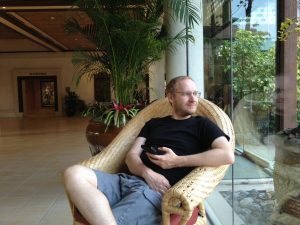 He is the owner of Unimatrix Productions, a couple-run independent game studio that has produced a platform for creating interactive fiction—Storycentric Worlds—as well as several adventure games. This interview was conducted via email in August 2016. Devi Acharya: To begin, tell me a bit about yourself—who you are, what you do, interesting details about your life, etc. You’re the owner of Unimatrix Productions—could you tell me a bit about how Unimatrix Productions got started and what you do now? Christopher Brendel: My name is Christopher Brendel, and I am an independent game designer. I knew that I wanted to make games back when I was only eight years old. Whereas most of my childhood peers were drawn into video games by consoles and action-based titles, my early inspirations were point-and-click adventure games and interactive fiction. To me, there was nothing quite like the feel of delving into a detailed story and playing as the central character. The form of escapism that these genres offered was far more appealing than any movie or novel could ever provide because of the inclusion of interactivity. Needless to say, I was quickly hooked and, being a storyteller at heart, could not wait to write my own tales. And so, while my friends spent their time playing sports, I began to teach myself the skills of the trade. When I was in high school, I formed a group called Unimatrix Productions with a few friends. Our goal was to produce Flash-based games and videos. At the time, there was no official company, and the content we produced was amateurish at best. Still, it provided us with some amusement, and it helped me to develop my design, graphic, and coding skills. When the time came to head to college, a lot of us went our separate ways, but I quickly decided to take my hobby to the next level and began to develop a full-fledged point-and-click game with a focus on quality storytelling. Originally, I was planning to release the game for free; but shortly after releasing a demo, the adventure gaming community told me that the game was good enough to charge for, and so I decided to turn my hobby into a business. In 2004, my childhood dream finally became a reality when I officially formed my studio. I decided to keep the name Unimatrix Productions as a tribute to my friends, and I released my first commercial game that year. Over the next several years, I released additional point-and-click adventure titles: Shady Brook in 2005, a demo for Stonewall Penitentiary in 2008, and The Filmmaker in 2010. I chose the adventure genre because its story-based nature appealed to me, but I never forgot my earliest inspiration—interactive fiction. So, in 2008, I began to formulate my own IF engine. My goal was to innovate the genre in order to make it appealing to a wider audience. I wanted to create games that had a low learning curve and would play well on mobile devices. It took many years and several prototypes to come up with a user interface that worked. Once I finalized the design, it became time to begin development on the actual engine. In the meantime, I needed practice writing interactive fiction, and so I made a game for Choice of Games, LLC in 2012 titled Treasure Seekers of Lady Luck. The project was loads of fun, and it confirmed what I already suspected: that producing interactive fiction provided a joy that developing point-and-click adventures did not. I felt like I was on the right path. From that point forward, I focused on working on my engine full-time. When it was in beta, I began work on my first game with it—a remake of my very first adventure game, Lifestream. To me, story is everything. As I stated above, I am a writer at heart, and I believe that the quality of storytelling in the vast majority of games is lacking. I have a lot of formal training as a writer, and there are many times that I considered becoming an author rather than a game designer. The need for complex stories in games is a topic that I’ve written about many times before, and I am passionate about it. To me, the best games are those that delve into the minds of three-dimensional characters who go through arcs over the course of the story. I always approach my games from a storytelling perspective, and I fervently believe that it is the story that keeps players interested in a game long after its gameplay grows stale. Here I am now, in 2016, having already released two story-focused games with my new Storycentric Worlds engine… and I couldn’t be happier! Devi: It says on the Unimatrix website that the game studio is couple-run—how has that been for you? Chris: It has been wonderful! I met Elle in 2012 while I was working on Treasure Seekers of Lady Luck, and we immediately hit it off. I had never previously believed in the cliché of “love at first sight” until I experienced it firsthand. Little did I know at the time that she, too, was both an avid player of story-based games and a writer herself. Needless to say, we quickly learned that we work well together, and so I decided to formally make her part of my studio in 2015. Having always worked alone on games, I was initially concerned that sharing the business would take some adjustment…but I was wrong! Elle and I complement one another wonderfully, and nothing makes me happier than getting to work alongside the woman that I love. When one of us gets discouraged, the other provides motivation, and we can share in one another’s accomplishments and successes. Now, we both work toward our ultimate goal of sustaining and expanding this business so that we can start a family of our own. It’s been a long journey to get to this point, and, while we still have a long way to go, we have never been more confident that we are on the right path. The best part is that, no matter what we face, we face it together. Devi: So far your studio has released several games, including interactive fiction games Lifestream and Shady Brook. Could you tell me about your involvement in these games? Chris: All of my early point-and-click adventures were produced solely by me. I handled everything from the graphics and programming to the writing and sound design. While I outsourced certain individual tasks at times, everything you saw came through me. The same is true of my newer interactive fiction titles. The Storycentric Worlds engine was created entirely by me, and the two games that have already been released, remakes of Lifestream and Shady Brook, were designed and written by me and tested by Elle. I am currently developing additional games with the engine, and Elle is writing a few of her own. Devi: Your studio has also created Storycentric Worlds, an interactive fiction website and game engine. What has been the process for making your own game engine? What has been the advantage of that versus using existing game engines? Chris: The process of creating a game engine is both daunting and time consuming. As I already mentioned, early development on the engine began in 2008 with a series of GUI sketches. Between 2008 and 2014, I produced several failed prototypes, and the design of the engine evolved over time. The first draft of the design that I ultimately chose was created in 2015, and it took nearly a year to turn that into an actual program. It is a complex task, because designing an engine not only requires making the engine itself but also designing a custom scripting language that allows for developers to create their own content with the engine. This was something I had never previously done, and so it was a wonderful learning experience. There were several times over the process of developing my engine that I contemplated scrapping the project and instead going with one of the many existing engines that are available. But I could not find an existing engine that fit my specific needs. I knew that I wanted to eliminate the text parser and replace it with a one-touch interface. I also knew that I wanted to include traditional features of interactive fiction games like an inventory system and auto-mapping. I wanted the engine to be capable of playing music, as I find that music can really enhance the atmosphere and emotions of a game. Most importantly, I wanted an engine that was compatible with every operating system and mobile device. Since I could not find any existing engine that met all those needs, I knew that I had no other option than to finish making my own. The nice thing about having my own engine is that I can add a new feature any time I might need one. For example, in developing Lifestream, I discovered that adding a shaking screen effect would enhance one segment. And so, instead of having to contact the owner of a third-party engine and request a change, I was able to simply go in and add it myself. There are continual new developments of the engine, as well, and it is nice to be able to choose what features to add as time goes on. Devi: You state on your site that the Storycentric Worlds engine is still in early closed-beta. What do you want writers and developers to know about it? Chris: Right now, the engine is available to any developer interested in making her own game. Unfortunately, the engine is currently “script-only,” which means that games are created by writing a series of INI and text files with an editor like Windows Notepad. While the engine definitely works, it is somewhat clunky to produce content in this form for anyone beyond seasoned developers. I am currently in the process of overseeing the development of a WYSIWYG editor that will make the process of making games far easier. With the editor, developers will be able to produce new works quickly and easily, and the only scripting that will be required will be made much easier. Also, I am currently in early development of an HTML5 version of the Storycentric Worlds engine that, when completed, will allow for games to be played directly in a browser window regardless of platform without the need for third-party extensions. There is not currently a scheduled release date for the graphical editor or HTML5 versions, but I am excited to share more news about these with the development community over the coming months. In the meantime, anyone who has specific questions is free to visit the Storycentric Worlds website at www.storycentricworlds.com or contact me at info@unimatrixproductions.com. I enjoy speaking with fellow developers, and I encourage anyone who may be interested to reach out. Devi: What have been some of the biggest challenges that you’ve faced in your development of games and a game engine? Chris: The biggest challenge that I’ve encountered thus far is, honestly, reaching my target audience. Back when I released my earlier point-and-click adventures, succeeding as an independent game designer was somewhat easy. There were few indie games at the time, and so anyone who produced one quickly found herself in the spotlight. These days, however, the game industry has changed substantially. The market is flooded with independent games, making it much harder to get noticed. Given that the games I am now producing are interactive fiction, a genre that is (sadly) largely ignored by the majority of gamers, it is hard—if not impossible—to gain the attention of most gaming sites, as they seem far more interested in mainstream titles with cutting-edge graphics that will appeal to the majority of their readers. Beyond that, the fact that the Storycentric Worlds engine is somewhat unique poses a separate challenge. The engine is, in many ways, a fusion of several genres: interactive fiction, of course, but also gamebooks, visual novels, and traditional point-and-click adventures. Any time a game fuses genres, the developer runs the risk of alienating the fans of each genre. Interactive fiction fans, for example, may miss the text parser or dislike seeing artwork in the games; gamebook fans may dislike the room-based navigation; adventure fans may dislike the text elements; and so on. So I have to walk a very fine line in order to appeal to the fans of each genre without losing their interest. One last—and sizeable challenge—is ensuring that these games appeal to both seasoned interactive fiction fans and those new to the genre. Since I am trying to draw in players who may be unfamiliar with text adventures, I have made the first two games in this series somewhat easy in terms of challenge. Based on feedback, I think that I made the right call, as several players new to the genre have commented that the games have just the right level of difficulty. Fans of interactive fiction, however, have commented that they find the games to be too easy and forgiving, which is understandable when comparing them to existing interactive fiction titles. My goal here is to slowly increase the challenge and complexity of the games in this series to ease those new to interactive fiction into the genre so that, ultimately, I can offer the same level of challenge that experienced interactive fiction fans are used to without turning off those unfamiliar with these types of games. As the series continues, players will begin to see an increase in the challenge, complexity, and branching narrative. In short, the games will become more complex over time as the audience adjusts to this new format. Devi: What are the future plans for you and Unimatrix Productions? Chris: Right now, Elle and I are focused on growing our audience and continuing to produce quality content. We want to help gamers to realize the potential for quality storytelling in games. It is our belief that games do not need flashy graphics or fast-action gameplay to provide a sustainable form of entertainment. Just as readers can delve into a novel, lose track of time, and become completely engulfed in their imaginations, so too can gamers. When players look back at our games, we want them to remember our stories and the emotional journeys that accompany them. One of our specific goals for the future is to counter the objectification of women that is far too prevalent in mainstream games through the development of complex, three-dimensional, realistic, and strong female protagonists. This will become evident in future titles. I am currently developing the third game in this series, and I have stories planned for at least a dozen more. It is my hope to release several games per year to provide players with an ongoing experience unlike anything that has ever been seen before in the genre. Devi: Was there anything else you wanted to discuss? Chris: Some people have asked why I decided to remake my existing point-and-click adventure games as interactive fiction instead of delving right into new stories. This was a tough decision for me. Initially when designing the Storycentric Worlds engine, I planned to begin with new stories. But after much contemplation, I decided to remake my existing titles for a few reasons. First, from a selfish perspective, I freely admit that I wanted to improve my existing stories. I wrote the original draft of Lifestream back when I was still in high school. Obviously, my skills as a writer have developed a lot since then, and I wanted to revisit my earlier stories in order to improve and expand them. Second, I thought that my earlier stories work better as interactive fiction than they did as point-and-click adventures. As the interactive fiction community had yet to experience my earlier games, they would not be perceived as remakes by that community, and so I thought it would be worth my time to adapt these stories. Lastly and most importantly, I decided when first working on the Storycentric Worlds engine to have all my games take place in the same fictitious universe. This led to the concept of featuring crossover storylines and characters, which will become more apparent in future games in the series. So, while each game can be taken as its own standalone story, those who play each game in the series will begin to discover common plotlines and themes that tell a larger tale, which will culminate with the release of a special title that brings together these elements in the future.